For today’s manufacturer, processing lines can be immense and complex constructs and the volume of materials and goods flowing through them can also be staggering. Timing and materials’ coordination are critical functions through these processes that determine the level of profitability for your operation. This is why manufacturers today look to RFID technology to help them run more efficient operations that help minimize production down time, optimize material and parts inventories, improve and maintain optimal labour output. BARCODE TECHNOLOGIES solutions are ideal for manufacturers who build several products on a single production line, or manufacture complex or customized products. 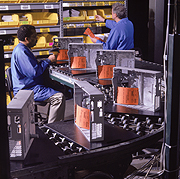 Assembly line personnel could use an RFID reader to verify which processes have been completed, to determine which inspections or tests are required and to automatically update the central production database. And production planners and inventory control personnel could use the BARCODE TECHNOLOGIES tags to automatically update the customer database and finished goods inventory, using an RFID reader and PC, rather than manually creating data entry sheets, which could introduce errors into the system. In addition, BARCODE TECHNOLOGIES system shows the real-time location and status of each single component in all processing lines.